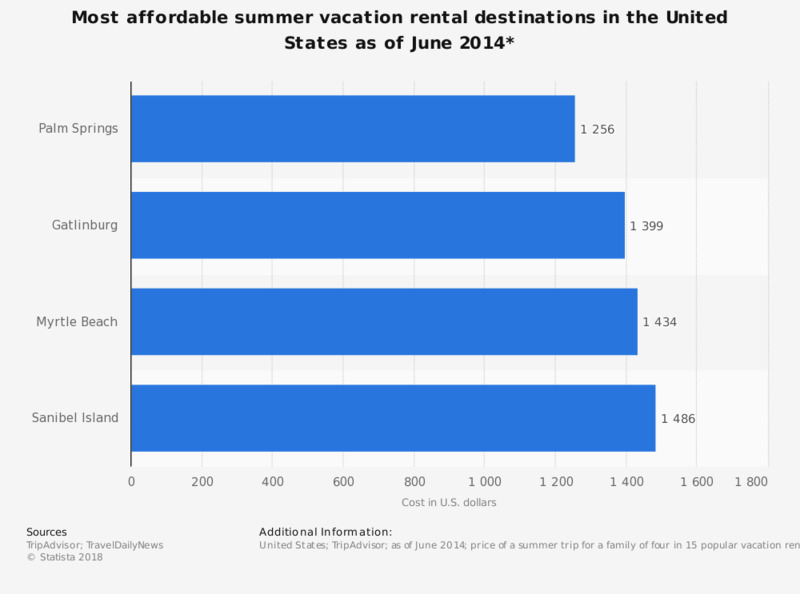 This statistic shows the most affordable summer vacation rental destinations in the United States as of June 2014. Palm Springs was the cheapest vacation rental destination with TripIndex cost of 1,256 U.S. dollars. price of a summer trip for a family of four in 15 popular vacation rental destinations in the U.S.
* The destinations are ranked by TripIndex cost which includes prices for a weeklong stay in a two-bedroom vacation rental property, a one-day bike rental, basic groceries and dinner at a restaurant.The source does not specify a date of survey. The date of survey given is the publication date. How do you stay when you are on holidays in Norway during Easter? How do you stay when you are on holidays abroad during Easter? Will you be traveling over any of the summer holiday weekends? Who do you plan on traveling with for your summer vacations?